One of the reasons that Keith Jefferson, 63, made such a success of Pink Panther Records was his life-long passion for music of all genres. Already one of the Globe Lane store’s best customers, he took it over in 1987. He ran it until 2003, by which time the shop was in Chapel Street, and had built up an excellent reputation based largely on Mr Jefferson’s knowledge of music, and his willingness to help. It was all part of the pattern of a life which had music running through it. 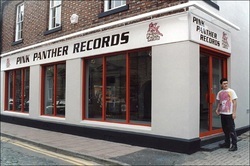 Pink Panther Records became an institution, popular with music-lovers for its large selection of vinyl, specialist works, and concert tickets in support of Cumbrian bands. What many probably didn’t know was that he was a good friend of the musicians who later became the legendary heavy rock band Black Sabbath when they were known as Mythology and then Earth. He spent time with them in Germany. Keith had a passion for music of all types,” said his widow Sheila. “He did various jobs, and for a long time, ran Keef’s Hotrod Disco. “He did that until he went into running Pink Panther Records. He really turned it around and loved being there. Keith loved all sorts of music, had a lot of knowledge. It was never too much trouble for him to look something up for a customer. Keith Jefferson Audio link.